Other aerial skills include tissu, corde lisse, static trapeze, bungee and harness work. Ground based skills include acrobatics, trampolining, theatre, dance (contemporary, contact and release) as well as stilt walking and magic. 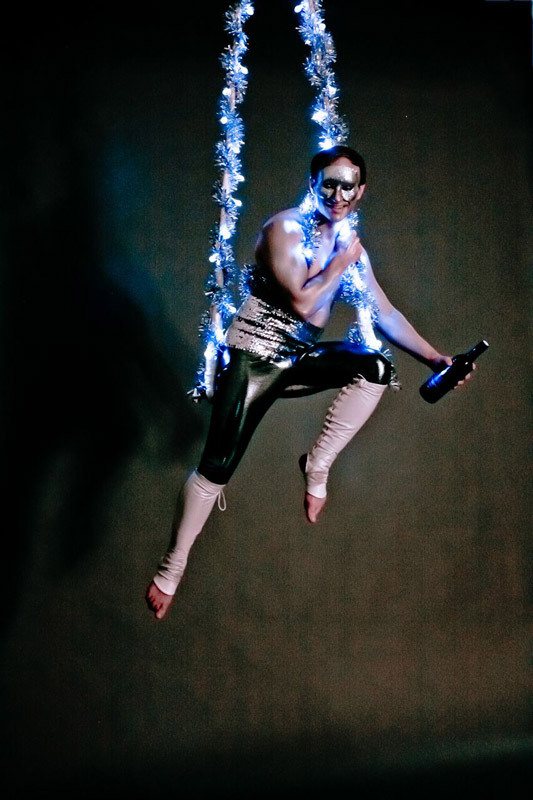 Make your event stand out with an icy champagne/wine service from a trapeze. This needs minimal rigging (load bearing beam rated to 300kg) and a minimum height of 3.5 metres. So perfect for low venues and marquees! 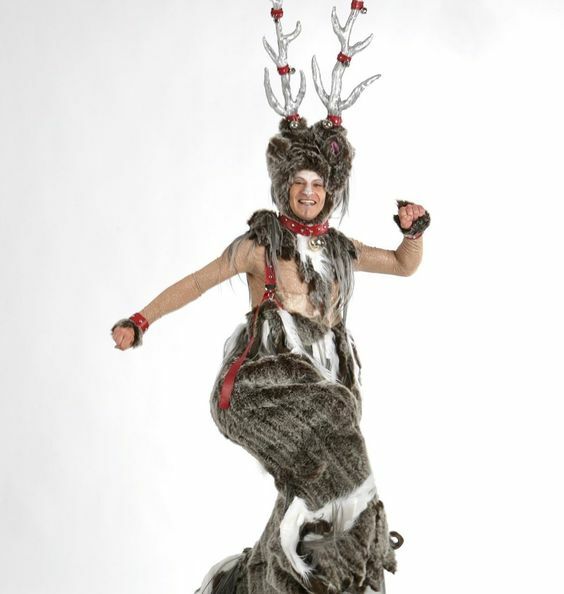 Greville can also provide a full act in this costume. Variations of the costume are available on request. Length: 3 sets of 15 minutes. Bouncy stilt character. Rufus is on his way to a glamorous party, but he can’t find his long lost brother Rudolph. Can you help reunite them? He is perfect for the festive season. Length: 3 sets of 30 minutes. 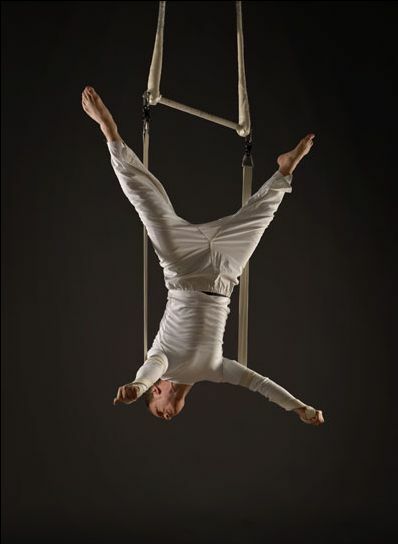 In this aerial straps act, Greville combines effortless grace and agility with strength and gravity defying movement to test the limits of the human body. Available as a static height act or with a winch/belay/counterweight system. Tutankha-Whom? Is a comedy straps act. Tutankhamun has finally woken up! He is very pleased to see you, but he seems to be coming undone. Can he use his aerial straps skills to rectify the situation? And what lies beneath his bandages? Only time will tell! Can be performed as a static height act or with a winch/belay/counterweight system. For Whom The Bell Tolls is also a comedy straps act. Let the Hunchback of Notre Dame take you into his inner sanctum and introduce you to his children the bells of the Notre Dame Cathedral. Unfortunately his children have other ideas! Watch as Quasimodo tries anything and everything in his arsenal of aerial straps skills to make his bells sing for you. Available as a static height act or a dynamic height act with a winch/belay/counterweight system. The Stupendous Crapini is a comedy magic act. Magician extraordinaire, will dazzle you with his fancy footwork and breathtaking acts of magical idiocy!